Today, we’re making Fat Bombs. 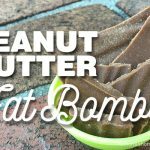 And not just any Fat Bombs – Peanut Butter Fat Bombs. What exactly are peanut butter fat bombs you might ask? Well, a fat bomb is just an easy and really tasty way to help your body get enough healthy fats. Why should you eat these? Because they’re good for you! Healthy fat is good for your hair, your body, your belly, and your overall mommy attitude, really. How many of you sit down and eat a 1/4 cup or so of butter? No? I wish I could just eat pure butter, but it’s just not socially acceptable. Sad. Anyway, when I’m breastfeeding I struggle to eat enough healthy fats and calories. I know not everyone has this problem, but I do. And I eat these even now, when I’m not breastfeeding. Since I’ve had braces, it’s sometimes hard for me to find the desire to eat. And if you know me at all – you know how crazy that is! For several days after I go in for a fitting or a tightening, my teeth ache and my mouth is raw, making it hard for me to eat. But I always like butter, peanut butter, and carbs. Load ‘er up, buttercup! 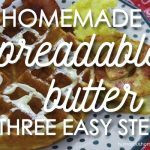 Ok, we’re about to talk about a very important topic in this day and age…Spreadable butter.